We don't analyze salary implications. We don't delve into metrics. We opine on what we see. And how that might affect our Texas Rangers. And we don't really care how that affects the other team involved. Ian Kinsler for Prince Fielder. The Rangers needed more power at first base. Fielder provides that. The Rangers needed a spot for Jurickson Profar. Moving Kinsler provides that. Are we happy about losing Kinsler? Of course not. Ian is one of our favorite players. Are we excited about what Fielder may bring to our Rangers? Of course we are. Apologies to Mitch Moreland, but seeing Fielder hammering the Home Run Porch in Arlington has us salivating. Losing two really good guys (David Murphy to Cleveland via free agency and Kinsler) is hard to swallow, but this is all about making the team better. Hopefully, this is just the start. The Rangers still need to upgrade the outfield and get more productive at catcher. We like this move, but it can't be all. There is more work to be done. The title says it all. The music of the (insert decade here) is so much better than the crap they're putting out now. How many times have you heard (or said) this? We have. Numerous times. And it's false. Listen to your classic rock station. Listen to your "best of the '60s, 70s and 80s" station. Listen to your classic country station. A lot of good songs playing, right? Of course there is. They only play the good stuff. Give any decade 20 years to sort out what was good and what wasn't and you can make a good radio station out of it. Good music is in the eye (or ear) of the beholder. Popular music is in the hands of the young and stupid. (we were once in that category). The good stuff stands the test of time. That is what you keep hearing long after it has fallen out of current popularity. You forget about all the crap that was popular right along with it. That is why your decade of preference is always better than current music. We haven't had a chance to weed out the bad from the good. That takes 20 years, in our opinion. In the meantime, if you hear something you like, enjoy it. Share it. If you hear something you don't like, ignore it, don't listen to it. Don't criticize it. We watched the CMA Awards. We were entertained. George Strait and Alan Jackson doing George Jones. Rascal Flatts, Darius Rucker and Jennifer Nettles singing with Kenny Rogers. Dave Grohl playing drums with the Zac Brown Band. Mick Jagger, Ellen DeGeneres, Julia Roberts, etc. congratulating Taylor Swift. Taylor Swift with Vince Gill and Allison Krauss. Brad Paisley, Carrie Underwood, Blake Shelton, Miranda Lambert, Kieth Urban, Kacey Musgraves, the Band Perry, etc. performing. But according to our Twitter and Facebook feeds, it was an unmitigated disaster. Why? Not because it wasn't entertaining. Not because the performances were bad. Because it wasn't country enough. Guess what? It was exactly what is being played on country music radio. And you know what else? We agree. It really ain't country. But we don't care, it was entertaining. And we like to be entertained by entertainers. If you want to play semantics, fine. It wasn't traditional country. It all reeks of musical elitism to us. We like a variety of music. The last time we put our master playlist on shuffle it gave us the following: the Band Perry, Cinderella, Marc Cohn, Billy Joel, Tesla, Martina McBride, Casey Donahew Band, the Bangles, Alice Cooper, Grace Potter, Poison, Iron Maiden, Jewel, Bon Jovi, Kim Mitchell, Halestorm and Roger Creager. Go figure. You can find the music you like if you want. Sometimes it takes work when your music of preference is not popular at the time. But it's out there. The machine on which you are reading this can take you to your genre of choice. And you may discover new and exciting music. Give it a try. What was played at the CMA awards is what is considered country music today. You don't have to like it. But that's the reality. If you are not entertained, change the channel. Don't listen to it. Rather than bemoan what is wasn't, we prefer to be entertained. And we were. If you're still reading this, that means you have survived 9 weeks of your eliminator pool. Congratulations. So far, Indianapolis, Baltimore, Seattle, Denver, St. Louis, San Francisco, Green Bay, New Orleans and Dallas are off of our board. Let's take a look at this week's games. Jacksonville (+13.5) @ Tennessee - That is the pick. No need to go any further. At least for us. With the teams we have left this is an obvious choice. The Jags are just that bad. And the Titans are much better with Jake Locker behind center. St. Louis (+9.5) @ Indianapolis - This one is solid. If you still have the Colts available. We don't. Oakland (+7.5) @ NY Giants - Sure, the G-men have looked better as of late, but do we really trust them right now? No, we don't. This is one to stay away from. There are five teams that are 6.5 point favorites - Green Bay over Philadelphia, Seattle over Atlanta, San Francisco over Carolina, Denver over San Diego and New Orleans over Dallas. We have none of the favorites available to us. That being said, Green Bay, without Aaron Rodgers? No thanks. Seattle has not looked good in their last two games and playing in the Georgia Dome, who knows? San Francisco playing at home against the Panthers may be the best of the lot. But Carolina is no pushover. Denver on the road against a division rival? Not going there. The Saints are good at home. Dallas is a mess defensively. Probably a good pick. But we wouldn't touch it. Stated above. Titans all the way. For what, you say? For inappropriately using the word "bye". 1. A secondary matter; a side issue. 2. Sports The position of one who draws no opponent for a round in a tournament and so advances to the next round. Did you see the second definition? Unless you are in a tournament (playoffs), there is no bye. The team just has an open week, i.e., they do not play. They are not advancing anywhere. If they played and lost, they still would play the next week. The NFL started this bastardization when they started having open weeks. And now it has caught on. It is not a bye. It is an open week. This is of no consequence other than the further erosion of the English language. Feel free to use "bye" inappropriately at your free will. We will think less of you if you do. Survival through Week 8, on to Week 9. So far, Indianapolis, Baltimore, Seattle, Denver, St. Louis, San Francisco, Green Bay and New Orleans are off of our board. Each has won. But things get infinitely more difficult from here. We have now used most of the good teams in the league. So our options are very limited now. Tampa Bay (+16.5) @ Seattle - No brainer, if you've got the Seahawks left. Chances are you, like us, do not. Minnesota (+10.5) @ Dallas - Full disclosure here. We are Cowboys fans and have been since birth. We don't like picking games involving Dallas. Either for or against. We have seen the Cowboys win too many games they should have lost and lose too many games they should have won. We rely on Vegas lines when making our survivor picks. They get paid to make lines and have no emotional investment. They have placed Dallas as double digit home favorites. Those teams win over 80% of the time. Chicago (+10.5) @ Green Bay - Another double digit home favorite. This is a divisional game, which would give us reason for trepidation most of the time. But Jay Cutler is out for the Bears. This makes it an easy pick for the Packers. Atlanta (+7.5) @ Carolina - This one, we are not too sure about. Atlanta has too much talent (even with the injuries) and we are just not sure about the Panthers yet. We don't have Seattle or Green Bay available, so it's between Dallas and Carolina. We are going with Vegas here and taking the 10.5 home favorite Cowboys. "Be Like Mike" was in reference to being like Michael Jordan, the greatest basketball player. Ever. That is not up for debate here. But Jordan never seemed to be happy. Always searching for something more. In the Cheap Seats, we propose "Be Like Sammy". Why, Sammy Hagar, of course. The dude has been rocking out for 40 years. And rocking out his way. Listen to Sammy's stuff from Montrose, through his solo stuff, with HSAS, the Van Halen years, with the Cabos and Chickenfoot. He's put the Hagar stamp on everything along the way. The most glaring example of that is with Van Halen. The consistency of Van Halen has been Eddie's guitar and Alex's drumming. That is unmistakable. But when Hagar was in the band, they sounded like Hagar. And when Hagar was in the band, that was when the band was the most fun. Sammy brings the fun. We just saw Sammy's Birthday Bash on AXStv. 66th birthday. And, in a word, it was fun. So, yeah, we want to be like Sammy. So far we have survived 7 weeks of NFL football. If you are still with us, you should be left with well under half of your initial entries in your pool. So far, Indianapolis, Baltimore, Seattle, Denver, St. Louis, San Francisco and Green Bay are off of our board. That leaves us with some good options left this week, but we will also comment on those that are not available to us. San Francisco (-16.5) vs. Jacksonville - Technically this a road game for the 49ers. But in reality, it's in London, England. It has been established that the Jaguars are not good. San Fran is not available to us, but if you haven't used them yet, this is the safest pick of the week. Washington (+13.5) @ Denver - Alas, Denver is no longer available to us. Double digit favorites at home win over 80% of the time. This game looks like an above 80% probability of the home team winning. If you have the Broncos available, this one is safe as well. Buffalo (+12.5) @ New Orleans - Now, this is a game that we're interested in. Why? Because we have the Saints available to us. This one looks like a lock as well. Seattle (-10.5) @ St. Louis - This is the fourth game with a double digit favorite. The Rams are without starting QB Sam Bradford. The Seahawks are not quite the same team on the road as they are at home. But this is the Rams we're talking about. Another safe pick if you've got it. Green Bay (-9.5) @ Minnesota - This is a division game. The favorite is on the road. Two things we like to stay away from if possible. But if you saw the mess that the Vikings offense has become on Monday night.......Mercy. Who knows who is going to start at QB for Minnesota now with the Josh Freeman concussion situation. But does it really matter? The Pack is another safe pick. For us, it's easy. New Orleans. Of the five games profiled, the Saints are the only team we have available to us. If any of these five teams are available to you, we think they are all safe. This whole targeting thing in college football is all out of whack. Not that we think it's a bad thing to penalize targeting. It's just that whole implementation is way off. Just to refresh your memories, an official can throw a penalty flag for a targeting foul and marks off 15 yards and the player is tossed from the game. But then, the replay booth can reverse the game expulsion. But the 15 yard mark off still stands.That's just stupid. Throw the flag. Make the call for targeting. Mark off the 15 yards. That's it. For now, at least. If we want to keep a possible suspension associated with targeting, let the replay determine that. After the fact. Have all targeting fouls be reviewed. By someone. Set it up. If the video review shows it to be actual targeting, then suspend the perpetrator for the next game. The way it is set up now is just backwards. So far, we have used Indianapolis, Baltimore, Seattle, Denver, St. Louis and San Francisco. If you are still with us, you are still in. Cleveland (+10.5) @ Green Bay - The only double digit spread of the week. We don't see where the Pack loses this game. The best bet of the week. Buffalo (+8.5) @ Miami - The Dolphins hold little future value at this point. This could be the best bet to pick Miami. Our only trepidation on this game is that it is a division game. San Diego (-7.5) @ Jacksonville - OK, so picking against the Jags has been a good ploy all season. Probably is here as well. However, Jacksonville showed signs of life against Denver last week and the Chargers are making a west-to-east cross country trip. We will pass. Houston (+6.5) @ Kansas City - We are surprised the spread on this one is not more. The Texans have completely fallen apart and are now without Matt Schaub (though that may not be a bad thing). But their backup came in and promptly threw a pick six. All that being said, this game scares us just a bit. We are very tempted to go with Miami or Kansas City. However, we are going with the safer pick in Green Bay. On to Week 6 of NFL Survivor and we are still going strong. Last week saw the first big hit of the season with the Jets win against the Falcons taking out between 30 and 40 percent of most pools. Thus far, we have Indianapolis, Baltimore, Seattle, Denver and St. Louis off of our board. This week's slam dunk, lead pipe lock is Denver over Jacksonville. We don't have that option. Next best? Seattle over Tennessee. Oops. That one is gone as well. But there are still plenty of options available. Let's take a look. Jacksonville (+26.5) @ Denver - Yes, you read that right. 26.5 point spread. We really don't see any way that the Broncos lose this game. If Denver is still available to you, take the Broncos and enjoy your weekend. No worries here. Tennessee (+13.5) @ Seattle - This one might have been a little closer if the Titans had Jake Locker available. Traveling to Seattle, where the Seahawks are a much better team than on the road, Tennessee should provide very little resistance. Arizona (+11.5) @ San Francisco - This is a division game, which we never like. We also remember what the Cardinals did to us on the road in New England last year. That being said, this looks like a good pick. Double digit home favorites win over 80% of the time. Oakland (+8.5) @ Kansas City - Another division game. And these teams hate each other. The Chiefs should win this, but we think there are better options. St. Louis (+7.5) @ Houston - Matt Schaub is a mess for the Texans. The Rams are just not very good. Unless Schaub throws more TD's to Ram DB's than he throws to his own WR's, Houston should win easily. But who's to say he will? NY Giants (+7.5) @ Chicago - If this game were not being played Thursday, we would really like to take the Bears. But the Giants will not go winless and a short week is the perfect time for something crazy to happen. Not touching this one. If we had Denver or Seattle available, that would be the pick. We don't. The pick here is San Francisco. Luckily, we don't follow many Dallas Cowboy fans or writers on twitter. We can watch the games and form our own opinions without having to deal with the inevitable twittersplosion that occurs every week. We get enough of that with Rangers fans. If you were lucky enough to watch the Dallas/Denver game, it was an epic regular season game. Just a joy to view. 51-48. Peyton Manning and Tony Romo trading blows. Excellent QB play from both. What's that? Romo played well? He threw the interception that single-handedly lost the game? He's a bum?Cowboys will never win with him at QB? Jean-Jaques Taylor of the Dallas Morning News claims Romo is the most polarizing figure ever to wear a Cowboy uniform. There are either Romo apologists for whom Romo can do no wrong and it is always the fault of someone else. Or the Romo haters who claim everything wrong with the Cowboys is due to Romo. We fall in neither of these camps. But, as always, we do have a take. Tony Romo and Ron Washington have a lot in common. If they were not so good at what they do, their mistakes would not be so magnified. We ask the same as we did with Wash, who is available that you would rather have at QB for the Dallas Cowboys than Romo? Available being the key word. Peyton, Brady, Rodgers, Brees, Luck, RGIII? None available. And won't be. Josh Freeman anyone? How about Mark Sanchez, Tim Tebow, Matt Flynn? If not available right now, will be at the end of the season. Any takers on those QB's? Didn't think so. Brandon Weeden? Kevin Kolb? Matt Cassell? Matt Leinart? Vince Young? Shall we continue? As Cowboys fans, Tony Romo is frustrating. But not nearly as frustrating as the GM. And you all know who we're talking about. We look at sports as entertainment. From an entertainment standpoint, Romo brings it in spades. Watching him play is a joy, as long as you don't let a football game ruin your week. We just want to be entertained. Sunday, we were entertained. If you've made it this far in your survivor pool, congratulations. But it only gets tougher from here. We are still in and have used the Colts, Ravens, Seahawks and Broncos in the first four weeks. We will still explore games that those teams are in, but will concentrate on who we have left. This week scares us, we're not afraid to admit. But it does feature some solid games to pick from. Jacksonville (+11.5) @ St. Louis - Good news, bad news here. Good news: double digit home favorites win over 80% of the time. Bad news: the Rams are not a good football team. Good news: the Jaguars are worse. NY Jets (+8.5) @ Atlanta - The Falcons may be the best 1-3 team in the league, for whatever that's worth. The Jets, at 2-2, are lucky to be there. Atlanta probably doesn't lose two in a row at home, although the Jets defense is for real. The offense on the other hand? Denver (-7.5) @ Dallas - Based on Philip Rivers and the Chargers shredding the Cowboy defense for over 400 passing yards and that Peyton Manning is on pace to throw for over 347,000 yards and 168 touchdowns (stats may be off a bit), this should not be as close as the 7.5 point spread. Denver is off our board, but the Broncos would be a solid pick if you have them available. Detroit (+6.5) @ Green Bay - We like to stay away from division games when we can. While we think Green Bay is a solid pick, we like other options better. And the Pack has much better value in future games. Houston (+6.5) @ San Francisco - Just stay away from this game. Both teams are way too unpredictable. As much as St. Louis makes us nervous, Jacksonville is just too awful. Plus, the Rams have absolutely no value down the road. The 2013 season for our Texas Rangers had ended in disappointment. Again. But that's not to say it wasn't a great ride. The Rangers came up against an ace in Game 163. And that ace, David Price of the Rays, delivered. Was there another September collapse? Yep. Just like 2012? Not so much. The 2013 Rangers had to win their last seven games to even force a Game 163. The 2012 Rangers just took a big dump in the middle of the field and wallowed in it the last week of the season and the Wild Card game. 2013 just felt different. The Rangers overcame quite a bit to end up where they did. The entire projected starting pitching staff was on the DL for 7 1/2 months. Or at least that's what it felt like at times. David Murphy and Mitch Moreland were terrible for long stretches, if not entirely. Lance Berkman anyone? Elvis spent the first half of the season in a slumber. And then there's the Nelson Cruz thing. This team, in reality, had no business being where they were on the Monday after the final day of the season. Which brings us to the hot-button topic as of late. 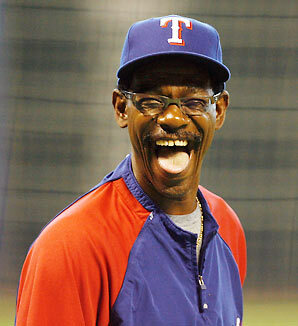 Ron Washington. Is he a great in-game manager? Nope. Does he make decisions that leave everyone scratching their collective heads? Sure. Would his every move be so highly scrutinized if his teams weren't successful? No. Would his teams be as successful if he were not the manager for 162 games? We think not. We are definitely in the pro-Wash camp. And we are not apologetic about that. We think Fox Sports Southwest's Emily Jones (@EmilyJonesFSN) had the winning tweet Monday night: I haven't covered a meaningless baseball game in four seasons. That says a lot about the #Rangers organization. First off, let's just get this out of the way, we think Johnny Manziel is an idiot. We don't think that is up for debate. We can say the same about Miley Cyrus. They were born about two weeks apart in 1992. Both 20. Both born into affluent or semi-affluent families. Both idiots. Both 20. We were idiots when we were 20. I'm sure many of you can relate. But we, at twenty, were not in the spotlight or had a camera on us 24/7. Some of the stuff we did at 20 would be prime fodder for YouTube today. But we didn't have to deal with that. We are in no way condoning the behavior of either. Just taking a step back and saying "You were 20 at one time. Would you want what you did then immortalized on a a social network, much less the national media?" Perspective. That's all we're saying, perspective. I'm going off the rails a bit with this post. Not sports, not music, but........cooking. Cooking is not rocket science. Or brain surgery. Or rocket surgery, for that matter. Good cooking does not necessitate a laundry list of exotic ingredients or the possession of intricate technique. In fact, the best alfredo sauce I've ever made (or eaten) consists of three very simple ingredients: butter, heavy whipping cream and Parmesan cheese. Although I firmly believe recipes are guidelines (except when baking, when it's actually a formula), some ingredients cannot be substituted for optimal results. When I say butter, I mean real butter. Not margarine, not I Can't Believe It's Not Butter (I actually can believe it's not butter), not some other butter substitute. When I say heavy whipping cream, I don't mean Half & Half, or milk, or, heaven forbid, skim milk. I would not recommend substituting anything for this recipe. If you're on a diet, then your best bet would be to find another recipe, because this is full fat, full flavor deliciousness. You will need roughly equal parts butter and heavy whipping cream. The amount will depend on how much alfredo sauce you expect to use. I would not recommend making much more than you need since this does not keep and/or reheat well. Melt the butter in a sauce pan over medium heat. Add the whipping cream and heat almost to a boil. Boiling and dairy products can create an experience you would not wish to repeat. Slowly stir in parmesan cheese until a thin gravy consistency is reached. During this step, make sure to stir constantly so as not to burn the cheese and also to ensure the cheese is incorporated enough to create a creamy smoothness. Now, ladle over your favorite pasta (fettuccine is my recommendation) and enjoy. That, by itself, is enough, but embellishments are definitely encouraged. A grilled (or baked) chicken breast seasoned with basil, garlic and oregano can be sliced or diced and added to the plate. My favorite embellishment involves a bit more technique, which can also be applied to the basic preparation. Sautee a few sliced mushrooms in butter and a splash of white wine until softened. Then add some fully cooked diced ham and lemon pepper to taste. Then add heavy whipping cream (roughly the same amount as the butter) and heat through. Add fully cooked and cooled noodles (again fettuccine is preferred). Stir and heat through. Add parmesan cheese to desired consistency, stirring constantly. When your preferred consistency and creaminess is reached, transfer immediately to plate and enjoy. We are here to help out the casual baseball fan whose head may be spinning a bit with all the non-baseball news surrounding baseball. And we think you know what we're talking about. - The Pirates are in first place in the NL Central. Not a typo. Yes, those Pirates. From Pittsburgh. The Pirates currently hold a three game advantage over the St. Louis Cardinals. And a lot of you thought that franchise had folded years ago, right? - The Texas Rangers and Oakland Athletics are currently in a dogfight for supremacy of the AL West. Separated by a mere one half game in the standings, and dead even in the loss column, this race could come down to the last day of the season as it did last year. - The Boston Red Sox and Tampa Bay Rays are involved in quite the battle themselves in the AL East. Just a game between them in the standings with Baltimore lurking around at 5 1/2 games out. - The LA Dodgers are probably playing the best of anyone in baseball right now, taking a commanding lead in the NL West over Arizona. - On a lesser note, the Kansas City Royals are above .500. Might not sound like much, but ask a Royals fan. It's time for A-Rod to fade away. Disappear forever. That won't happen, so it's time for us to just focus on what is happening between the lines. Some good baseball yet to be played. Let's enjoy the pennant races. That's what it should be all about this time of year. With about a month and a half left in the season, here is where our Texas Rangers stand. In first place. But Oakland is not going away. In the past month, the Rangers have gained a Matt Garza and an Alex Rios. They have lost a Nelson Cruz, a Colby Lewis and now a Matt Harrison. So where does that leave them? Better than before. "What? ", you say. Texas has not had Lewis or Harrison for practically the entire season. Their losses don't mean that much. Sure the Cruz loss hurts, but Rios can fill in adequately and provide production. Not the same as Cruz, but he will contribute. Now, take a look at the rotation. Better to have Garza than a maybe Harrison or Lewis. Or maybe Neftali Feliz. What the Rangers have right now is what they're going to have to go with down the stretch. We like the chances. However, looking at the schedules, the Rangers need to have at least a four game lead going into September. Texas has an easy August schedule. Oakland's is tougher. The tables are turned in September. And for the "Fire Wash" crowd, Ron Washington deserves no less than manager of the year if he guides this team to the playoffs. We won't bore you with the details now, but it could be coming at a later date. The saga of Johnny Manziel, Johnny Football if you will, has been well chronicled. From almost being suspended before the 2012 season to winning the Heisman Trophy, from the insipid tweets to "oversleeping" at the Manning's quarterback academy, the Texas A&M quarterback has gone on quite the ride. Johnny Football's latest transgression to come to light may land him in hot water with the NCAA. It has been reported that Manziel received -gasp- monetary compensation for signing memorabilia. Not that big of a deal in the grand scheme of things. As opposed to stupid tweeting and "oversleeping", generating income from your own fame is against NCAA rules. After the weasels at the NCAA get finished probing this situation, it could be bad news for Texas A&M and Johnny Football. We'll have to wait and see how that all plays out. We want Manziel to play. He's fun to watch. But apparently he's not very bright. Either that or he has an extreme sense of entitlement. You can only play the "he's just 20 years old" card so many times before it becomes a problematic behavioral flaw. Given the NCAA's own investigative incompetence in the past, we wouldn't be surprised if they turn up insufficient evidence to suspend Manziel. Until Johnny Football pulls another bone-headed stunt. So much happening in the world of sports lately. And nothing that has to do with on-field performance. We have Riley Cooper, Johnny (Johnny Football) Manziel, BioGenesis, Alex Rodriguez and Nelson Cruz. Knee jerk reactions are for twitter and facebook. Here in the Cheap Seats we like to let things marinate before jumping off the deep end. Therefore, we will tackle each issue separately and with pertinent distance. What he said was indefensible. We aren't going there. It seems as though Riley is a bad drunk. According to him, he was as surprised as anyone else when the video came out because.............HE DOESN'T REMEMBER SAYING IT!!! Dude, if you're going get that hammered at a Kenny Chesney show, we would lay low. We have seen Kenny Chesney. It's not worth going stupid. Sure, Chesney is popular. But not that great. Ultimately, it's about what Cooper's teammates think. Idiots like us, and idiots writing for the major sports sites can espouse whatever opinion we/they feel, it doesn't matter. It really doesn't matter what "we" think. Let it play out as it will. The debut of SharkNado on the SyFy channel. Sure, you can use the All-Star break as the line of demarcation, and the Rangers haven't been good since then (2-7). But we believe it has something to do with SharkNado. What other logical explanation can there be? As the Texas Rangers gear up for the remainder of the season, let us take a look back at how things fared before the All Star break. There were 394 pitchers who went on the disabled list before the break, 96.7% of those pitchers were Rangers' starters. Seriously, the pitching staff was hammered and hampered by injuries. When the rotation consists of Yu Darvish, Derek Holland, and, take your pick of Grimm, Lindblom, Tepesch, Wolf, or the neighbor kid down the street, that the Rangers are where they are is commendable. And where are they? Thirteen games above .500 and two games back of Oakland in the AL West. Plenty of time and games still left. The offense on the other hand, meh. Sure Ian Kinsler and Mitch Moreland both joined the pitching staff on the DL, but the offense has wasted many good pitching performances. Nobody ever won a game scoring zero runs. The bullpen, while overworked and overexposed at times, has really held it together. Kudos to Joe Nathan, Robbie Ross, Tanner Scheppers, et al. Going forward, Lance Berkman can't be counted on to stay healthy and even if he is, can he even hit? Elvis Andrus and David Murphy need to figure it out at the plate. And quickly. Alexi Ogando seems ready to return, but will the Rangers ever see Matt Harrison, Colby Lewis or Neftali Feliz on the field this season? We would proceed thinking not. The trade deadline looms. The Rangers need another starting pitcher and a right-handed bat. This is still a very good team. And instead of all those clamoring for manager Ron Washington to be fired, here in the Cheap Seats, we think he has done a tremendous job of getting the Rangers where they are right now. Give us a better available option. Or would you rather have Bobby Valentine? Puh-leeeeze! The second half starts tonight. Sit back and enjoy, it's going to be a fun ride no matter how it turns out. I had a brief facebook conversation the other day with somone about cover songs. Or more precisely, one song that was recently covered. My friend's post had a link to the cover version of the song along with a comment that said "better than the original". Was it better than the original? Well, no, not really. But it was fresh and new and on his mind. We eventually agreed that the cover was not better than the original. Covers rarely are. Especially if the original recording was written by the original artist. Are there exceptions? Sure. At least as far as we are concerned. However, a certain twitter conversation enlightened me to the fact that some regard any covers as inferior. The conclusion of that conversation ended in "to each his own." The writer of the song usually has a personal investment in the song and/or a story interwoven into the song and can sing it like they mean it. A lot of it has to do with perspective. Was the first time you heard a song the original, or was it a cover? Growing up, the only version of "Blinded by the Light" I ever heard was Manfred Mann's. Little did I know that the song is a Bruce Springsteen original. Listening to the local classic rock station, my daughter would start singing along to a song. Me: "How do you know that song." Her: "It's in (some animated movie). They do it better in the movie." All perspective. But for the most part, give me the original. Rafael Nadal and Roger Federer out by the second round. Maria Sharapova and Victoria Azarenka also. Serena Williams ousted before the quarterfinals. The last four days of Wimbledon must have been horrible. Congratulations to Andy Murray especially. Finally a Brit winning Wimbledon. Congratulations to Marion Bartoli. Wins the championship without dropping a set. The championship matches did not live up to what took place two days prior, respectively. Murray and Bartoli dispensed of Novak Djokovic and Sabine Lisicki in straight sets. Props to Murray and Bartoli. They both played very, very well. On the women's side, Lisiscki was gassed, both mentally and physically. A three set win over Serena in the round of sixteen in which she was down 3-0 in the third set only to come back. Then in the semis, she pulled the same trick on Agnieska Radwanska. Finally winning 9-7 in the third. One of the most entertaining matches on the WTA we have seen in recent years. But that was only a prelude to the Djokovic match against Juan Martin del Potro. A five set insta-classic. Both gentlemen battled, gutted, dug deep. The fourth set tie-break, won by Del Potro, should be played on a loop on the Tennis Channel when they are lacking for programming. We would watch. It was that good. Djoker will get another Wimbledon at some point. Maybe Lisicki will get her first. The finals were a celebration of Murray and Bartoli, not a referendum on Djoker and Lisicki. Things just got interesting going into the hard court season. US Open, we can't wait. While not being able to watch the first week of Wimbledon matches live, we took to Wimbledon Primetime on the Tennis Channel. As we were watching, the Olympic Games and NBC kept creeping into our mind. The Tennis Channel does a fantastic job at broadcasting matches from the majors that we tennis fans already know the outcome. They begin the broadcast recapping the big stories of the day. Then, the best parts of the best matches are shown. Interviews are interspersed throughout the tennis action. It makes for quite enjoyable viewing. While this is definitely not an apples to apples comparison, NBC could learn a lot from the Tennis Channel leading up to the 2014 Winter Olympics in Sochi. NBC has exclusive broadcast rights in the United States for the Olympics. The Tennis Channel does not for Wimbledon. ESPN has the live rights. Therefore NBC can control what and when events are broadcast for U.S. consumption. This is not a bash NBC post. On the contrary. For the most part NBC does an outstanding job covering the Gamesl with its many broadcast platforms (NBC, NBCSports, MSNBC, CNBC, USA). Many more different events are given more extensive coverage than in the days of one broadcast outlet. We love that one of the stations becomes the de facto Curling Channel during the Winter Games. But the rub comes with the primetime telecast on the mother station. The show itself is fine. Show the most anticipated races, competitions, etc. Sprinkle in some human interest and interviews. It is good viewing. The problem is with the intelligence-insulting way that things are presented - as if nobody knows the results. Anyone with a smartphone, internet access, a television or radio can get the results if they desire. There is no reason for NBC to pretend otherwise. Also with live streaming available, there is not reason for NBC not to broadcast the top events live either. A large portion of the United States population is unable to view the events live anyway. The primetime telecast should not suffer. And don't deprive those that work during primetime the chance to see the events live. And stop pretending we don't know. Maybe it will ruin everything for the one guy living in a trailer in the foothills of a mountain range with no telephone, no internet and through an elaborate and complex configuration of aluminum foil and wire coat hangers is able to get a lone NBC station on his 19 inch black and white television. But he will persevere. Got Cheap Seats (general admission, really) for The Band Perry at the Whitewater Amphitheater outside of New Braunfels. Cheap in price only, we were about seven people back from the stage. Texas Country artist Kyle Park opened the show. He and his band were very, very good. Being relatively new to the Texas/Red Dirt Country scene, we were not familiar with all of thier catalog, but that really didn't matter. His performance was great, his band was impressive. A special recognition of the bass player who was playing with a cast on his right hand and never missed a note (as far as we could tell). We were there to see The Band Perry, really. What this post is all about, but Kyle Park and his band were so good, we couldn't not mention their great performance. We have seen TBP before, opening for Brad Paisley. That's where we really fell in love. Their live show is one of the best we've seen. And we've seen a lot. They killed it. From the first note. TBP hit the stage like a battering ram with "DONE." And didn't let up until closing with "Better Dig Two". In between, they played all the hits from their debut album, all the fan favorites, "If I Die Young", "You Lie", and "Postcards From Paris". As well as lesser known songs from that album. Also included was a hefty helping of songs off the new album "Pioneer". Sprinkle in some classic rock like "Free Fallin'", "A Little Help from My Friends" and a full version of "Fat Bottomed Girls" along with a little "Hey, Ho" and "Amazing Grace", and you have the makings of a show. But you have to pull it off. And they did. Kimberly's voice is more powerful live than what is represented on record and spot on. Though not represented well in recordings, you get to see how much the brothers (Reid and Neil) contribute. And the rest of the band was phenomenal. TBP is not your traditional country artist. And that's not a bad thing. Their live show is more reminiscient of Bon Jovi than George Strait. Not that either is wrong. But for us misplaced Classic/Southern rockers, this is good stuff. Not a product of winning a contest, The Band Perry paid their dues the old fashioned way, by gigging relentlessly. And it shows. For being so young, they are masters of the stage. We cannot think of one bad thing to say about the show. That is rare. We would be remiss not to mentiont the Whitewater Amphitheater. Our first time there. Great venue to see a show. Not a bad seat in the house. And the concession prices are more than reasonable. In the wake of Sandy Hook, the Boston Marathon, West explosion and Oklahoma tornado; it seems a bit silly to be discussing sports and music. That being said, sports and music have a tendency to unite. And bring people together. Kevin Durant of the OKC Thunder has donated $1,000, 000 to the tornado relief efforts. Matt Kemp, an Oklahoma native, will donate $1,000 for every home run he hits between now and the All-Star break. I'm sure many others are doing much. Those are just two examples that we're aware of at the moment. There is a huge rock/metal festival taking place in Oklahoma this weekend, Rocklahoma. Many charity auctions will take place to benefit the tornado victims. A charity/benefit concert is also in the works. Again, this is all that we are aware of at the moment. Life goes on. Very differenetly for those affected by tragedy. Here in the Cheap Seats, we mostly deal in frivolity, truth be told. And that has it's place. Right now we take a moment to pray for those affected, praise those who have responded and pray again. As fans of the Texas Rangers we, here in the Cheap Seats, suffer from sleep deprivation during weekday series on the left coast agaisnt West Division rivals Oakland, Seattle and Anaheim/Los Angeles, California. We are so happy that Houston has joined the AL West (and not becuase they are horrible). That means more games in the Central Time Zone. With the advent of daily interleague play and the inevetible (in the eyes of many) adoption of the DH in both leagues, it may be time for radical realignment in MLB. We have often pondered a realignment of the West divisions, self-serving as it may be, but Matt Yallof of MLB.com thinks when (not if) both leagues go to the DH, then radical, geographic realignment should be considered. Everything looks good in the Eastern Conference, as far as we're concerned (but we really don't care that much). The problems lie in the Western Conference. Geographically speaking, it kind of makes sense. The whole North/South divisions in the Northwest and West Divisions. But the time zone issues make it a nightmare for fans of the Twins and our Texas Rangers. This just makes more sense. And lets us get more sleep. Here in the Cheap Seats, we have long been proponents of the best of five for men's tennis in the majors. The game has become more physical. Wear and tear on the body has become more pronounced. This is not your father's tennis. Does the drama of the the five set match outweigh the consequences? In today's tennis world, we think not. At Indian Wells we saw Martin del Potro play three straight three set matches in the quarters, semins and finals. All three matches were fantasitc tennis. All the drama was present in all three matches. And it was more urgent. Too many times in the major events, the winner of a long five set match puts up little resistance in the next round's match. We think the improvement of the overall quality of matches would outweigh the loss of a few epic five setters. Here in the Cheap Seats, we are long time fans of the Texas Rangers. Almost since their inception in 1972. Although we were four years old at the time. But as soon as we had an understanding of baseball, we were fans. We have seen many great players come and go over the years. While they were wearing out team's laundry, we were their fans. As soon as they changed uniforms, they became the enemy. So it goes in this age of free agency and players changing teams on a regular basis. Josh Hamilton made his return to Arlington this week in the uniform of the Los Angeles California Angels of Anaheim California. The hated rival. Based on that alone, he could not have envisioned a lovefest. Had it simply been a case of Hamilton taking more money and moving on, so be it. Thanks for the memories, Josh. Now you're playing for the enemy. Don't expect the red carpet when you waltz back into town, but best of luck (but not too much). But no, couldn't be that simple. Couldn't, as the Bible says, hold the tongue. Had to disparage Rangers' fans. That is where the real rub is. As Rangers' fans, we can understand leaving for more money. But after you sign with the Rangers' biggest rival, for more money, and claim God was telling you southern California was where you needed to be, don't call us out as being bad fans. Rangers' fans embraced Josh from the start. And we were rewarded with two World Series appearances, which we will be eternally grateful. Rangers' fans aslo booed Hamilton at the end of 2012 when his play was abhorrent. That's what fans do. As for us, we will be rooting for the current band of one-gloved, bat wielding mercenaries who currently wear the laundry of the Texas Rangers. Sorry Josh, don't expect to be welcomed with unconditional love back to the Claw and Antler Nation. You're wearing the wrong laundry. And check your tongue with your baggage. We definitely lived up to the blog name on this one. We had cheap seats. We saw Bon Jovi on their (yes, their, not his, this is a band, not a solo act......more on that later) Because We Can tour. Aptly named. Sold millions of records. Sold out arenas and stadiums worldwide for years. Have more money than they can spend. Why do it? Because they can. The four core members of the band are most decidedly a band. The bass player has been with them for years, but never appears on album covers and such as a member of the band. The second guitarist was just that, a second guitarist, although they did allow him a couple of solos and proper acknowledgement. But the four guys who have been in the band since the inception are the band. Tico Torres played flawless thundering drums. The kick drum could be felt in the gut, as it should be. David Bryan is the pop metal generation's Jon Lord. He plays keyboards as a lead instrument and not as a layeing instrument. Richie Sambora's playing was at times inspired and when needed was flawlessly true to the original recording. Jon Bon Jovi stills knows how to make the girls scream, although now the screaming girls are middle-aged housewives. His pipes are still excellent and he delivered in every way fathomable. What was interesting to us, as Bon Jovi fans since their debut album, was the crowd. There were many families there, obvious attempts by the parents to expose the offspring to music that they loved. There were many, many people there of our age (middle class and middle age). There were some younger college and high school-aged kids in attendance. Fortunately, the majority of the crowd was like us - grew up on the Bon Jovi hits of the late '80's/early '90's. When those classic songs were played, the fans like us were up, singing and dancing and reliving our youth. The younger generation just seemed bored. Sad. Bon Jovi opened the show with the '80's classic "You Give Love a Bad Name". Not a bad start. They have a new album out, so, of course they played four songs from that album. Not bad songs, but since the album just came out this week, nobody knew them. But for people our age, every song you wanted to hear, they delivered. Highlights? While there were many, out favorite was what they closed the regular set with. "Bad Medicine" with "Old Time Rock N Roll" thrown in towards the end. The entire song, not just a passing tidbit. That had the crowd on its feet and singing along. Another highlight was the performance of "I'll Be There For You". If there was any doubt that this a band (or at the very least a two-man show) this was it. This was the first time they performed this song this tour. Richie Sambora sang lead on the song. Jon Bon Jovi was not on stage. The only critcism we have with the show is they did not do anything from 7800 Farhenheit. Granted, not many people know the songs from that album and, admittedly, it was not one of their stronger offerings. This is just us, but we first saw Bon Jovi in support of that album, so it kind of holds a special place in our hearts. Would have loved to have heard "Tokyo Road" or "In and Out of Love". But that is minor. However, they did do the song that first turned us on to Bon Jovi back in the day - "Runaway". We were pleased. Speaking of, the first time we saw Bon Jovi was, we think, 1985. Opening for Ratt. The first concert we attended. So this kind of closes the circle for us. Are We Moving Towards One Macro-Genre of Music? Update: We have recently become aware of a website that we really enjoy reading. As a bonus this article was a little over 2 years ahead of us coming to this conclusion, though through different means. Here in the Cheap Seats, we are fans of good music. Or at least our definition of good music. You know the premise, we can't explain it, but know it when we hear it. With the exception of rap, we are generally not opposed to any type of music, so long as it appeals to us. Which brings us to this. Why are we still putting music into a specific genre? That only limits the audience. If you take a look at the music you like, surely there is some common vein that runs through all of it. Even if your tastes are eclectic. We are going to post two songs below. One belongs to a current country music darling, one to a an up-and-coming hard rock/heavy metal act. With a few tweaks in production and instrumentation without changing the integrity of either song, just changing the artists name would move the song from one genre to the other. To get the full effect of what we are talking about, we'll give you a step-by-step on how we arrived at our conclusion. First listen to the Carrie Underwood song "Good Girl". Preferably with you eyes closed. Just concentrate on the music. Ignore the video. Now that you have that song on your brain, which is in fact a rock song, listen to the following Halestorm song "I Miss the Misery", again just listening, the images tend to convolute the mind. While listening, imagine Carrie Underwood singing. The guitars pulled back in the mix. Some keyboard layers. A thinner drum mix. And we can hear places where a banjo would be apropos. Now go back and listen to the Carrie Underwood song while thinking about more up front guitars, a heavier drum sound and more bottom end. We think slight adjustments in the instrumentation and production could make the songs practically interchangeable. Put "I Miss the Misery" on a Carrie Underwood album and suddenly it's a country song. Let Halestorm record "Good Girl" and it's a hard rock song. Apologies to those who have been missing missives from the cheap seats. We kind of took February off. Not much going on in the sports world. OK. So they had that little thing known as the Super Bowl, but it happened early in the month. After that? Well, not much happening. We love making fun of the various CFB uni bloopers. But now we feel bad. Because this is just.......hideous. OK, to be fair, the Louisville uni is not atrocious. But the Kansas, Notre Dame and UCLA unis are beyound belief. And not in a good way.